Stephen Kenny of Kenny Heating and Plumbing has been in the heating & plumbing business for many years and installs high energy efficient boilers and provides efficient and reliable boiler servicing and repairs throughout Dublin and surrounding areas, particularly in the Tallaght, Kiltipper, Jobstown, Templeogue, Kilnamanagh, Brittas and Castlekelly areas. Boiler Upgrades and Heating Controls upgrades give you extra savings on your heating bills. The Sustainable Energy Authority Ireland (SEAI) and all gas boiler manufacturers recommend an annual boiler service to insure your boiler is safe and efficient. 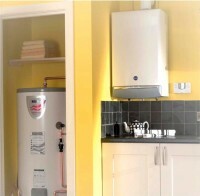 Contact us today to arrange your boiler service. We also provide a full Plumbing, including emergency plumbing, and Bathroom Installations service. It is a legal requirement to be registered with the Registered Gas Installers of Ireland (RGII) to install, repair or service a gas boiler. Ask any gas installer to see their picture identification, including their RGII ID number, if you have any doubts about them. Your gas installer should provide you with a certificate of conformance on completion of the job.